Most of us see dinosaurs as big scary animals that could eat you alive but just like humans there are some more friendly dino’s around to. 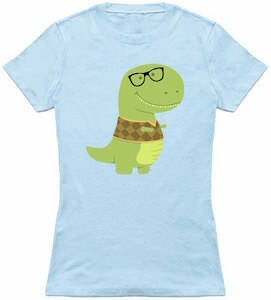 On this t-shirt you can see a geeky T-Rex and he looks real friendly. This Tyrannosaurus had a big smile and wears a plaid vest and some glasses. I have the feeling he just could be working in the office next door. This cute dinosaur t-shirt is available in men and women’s styles in sizes ranging from Small all the way up to 6XL and all are made from 100% cotton. And if you don’t like light blue then you can just pick a different color for your dino t-shirt.